The AES show gives us an opportunity to drive innovation. Can it be enhanced? 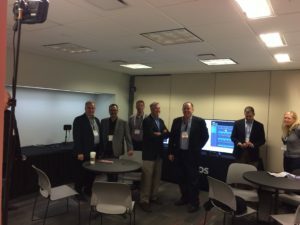 With a bit of time now elapsed since the end of the AES show, I have had the opportunity to gather my thoughts on the experience. A bit of a cost/benefit analysis if you will. The ability to critically reflect on practices – both in the personal and professional domain – is a key aspect of growth and thus something I feel very strongly about. 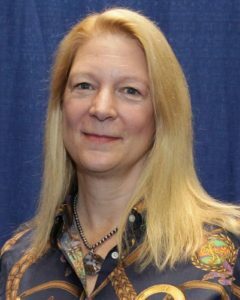 I thought it might be beneficial to share my musings here to open up the debate and gain insight from other industry players on how they view the value of tradeshows. AES – and any tradeshow for that matter – is a big commitment. There’s not just the (eyewatering) cost of booth or floor space at the show, but then the transport, accommodation, show services, graphic design and all the other little niggly bits that come along with exhibiting. On top of that there’s the time and energy costs. We all come back from tradeshows pretty exhausted – and this year we had back-to-back obligations that took us away from the office and saw us travelling for exhibits and installations for nearly three weeks. So why bother? What are the gains? What I came to realise is that the central benefits of tradeshow attendance are largely intangible, which makes any form of ‘formal’ analysis largely unachievable. There simply aren’t metrics for the value that comes from meeting and interacting with so many industry professionals in such a dynamic and focused environment. Over the course of the year our engagement with professionals outside of our direct sphere can be very limited – and when we do, the interaction risks being functional and brief. Tradeshows change that. At the AES show, the social element and face-to-face interaction allows us greater opportunity to form the bonds and friendships which are fundamental to the way we do business, foster trust, and recognise and meet the needs of others. 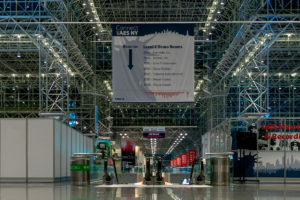 AES is particularly notable for this considering it heavily positions itself as a show about education and technology innovation as well as practical applications. It’s full of “tech geeks” like me and I always look forward to what I will learn at this show. One important element of a tradeshow is the fact that it gives us opportunity to interact with people whom we might not meet otherwise. Within our own niche of the industry, we tend to think we know who is important and relevant, and then we reach out to them and form a connection – by email, phone and only occasionally in person. At the latest AES show for example, there were a number of excellent papers and panels that lead to a lot of discussion and thought. As a result, even something as small as standing in the coffee line and finding yourself in conversation with a fellow attendee about the topics of a panel can foster a benefit you’d never have expected. I believe strongly that we must leave ourselves open to these occasions of ‘fate’ and happy circumstance; success is not about creating all the opportunities yourself, but also about seizing them when they present themselves to you. What better environment to foster innovation and drive creative energy than a gathering where everyone is there to learn and examine possibilities? Even more significantly for me, tradeshows such as AES are where we have the biggest opportunity to engage with the ‘next generation’ of sound professionals. In my opinion, this is by far the most important element. The event acts as a melting pot of the old and new, where old-timers are able to impart their wisdom, and newcomers have the chance to challenge long-standing accepted practice, thus teaching the old dogs some new tricks. Be they students, recent graduates not yet tied to a company, or small start-up businesses making their first tentative steps into the industry, the newcomers have extremely valuable questions and ideas that when actively shared, I find incredibly energizing and engaging. Alteros’ top engineers reported a similar bi-directional experience: as they spoke with new contacts or followed the presentation of technical papers, they could ask questions and were in turn asked questions; sometimes challenging and thought-provoking. Working like this drives the industry forward, and also provides a valuable “return on investment” for our company when we are able to send our staff. At the AES show, I find the booths and displays somewhat interesting, but quite secondary to the technical papers, presentations and panels. As usual, I had the ability to participate on informative panels as both an audience member and as a speaker. From an audience member’s point of view, I was able to gain huge amounts of knowledge that I might otherwise have missed. Whilst we all remain engaged with industry press as part of our own professional development, we tend to consume what we seek – leading us down predefined paths of growth. AES and the scheduling of diverse panels creates the opportunity for us to stumble upon knowledge that would not normally constitute part of our own education-seeking activities. The AES programs do not merely deepen my knowledge, but broaden my range, and they expose me to the needs, perspectives and questions that are relevant to making progress in the industry. I like participating on panels and forums. As humans we are intrinsically ‘sharing’ animals, and there’s a huge kick from knowing that you’re contributing to something bigger than just your own gain. I like helping others learn from my experiences. But more so, on each panel something unexpected always comes up. Someone always asks a question I was not expecting. Participating like this is a huge opportunity to have “fresh” or different minds consider and question fundamental knowledge or assumptions. Knowledge can be challenged and dissected –and I may be asked to either defend or relinquish ‘truths’ that I have accumulated over the course of my career. This is an intellectual and analytical exercise that few are granted the opportunity to do so comprehensively, but which is absolutely fundamental to personal and professional growth. Despite these fantastic benefits, that is not to say that I remain uncritical of the AES show format. In light of the money we as an industry spend at these types of shows, I think it’s important that we’re vocal in the changes that we’d like to see made. Whilst the programming is of immense value, I feel it needs refinement. The most engaging and valuable panels I witnessed (and participated in) were those where the audience had an opportunity to take control and lead the direction of the conversation– creating a two-way dialogue. That was far more enlightening than panels in which it was clear that the person speaking was little more than a corporate mouthpiece – regurgitating the lines that had been fed to give the brand in question greater exposure and position them as an ‘authority’. What we really need are genuine authorities in the field engaging with each other – and the audience – and probing the important questions which continue to wrack the industry; speaking to the next generation of sound professionals. This requires participants to display a great deal of bravery – to stand in front of an audience with no script, and knowing that only your knowledge and your wits that will carry you through the next hour. But it is this kind of dialogue we need – with direct audience engagement – and not strictly structured, sterile presentations. The audience is the very important second piece to this process. To create a challenging, meaningful and perspective-shifting dialog, of course you need the “experts,” but you also need a good sized audience that is interested and engaged. This leads to my final point. I stressed above the idea that the AES show holds such immense value because of the way it can bring old practitioners together with the upcoming wave of recently graduated audio engineers and professionals. However, the current ticket structure – in which more has to be paid to access programs, workshops, presentations and discussions – is actively prohibitive to this much-needed interaction. Students and newcomers in the market are precisely the people who can’t necessarily stretch to this additional expense, but precisely the people who we need to have there in order to promote fresh ideas. I hate that the most interesting aspect of the show programming is sequestered behind badge-scanning personnel, prohibiting access to those who may benefit both them and me the most. One thought I have is that established market competitors could ‘sponsor’ full-participation tickets for newly-qualified professionals, or simply sponsor talks and events that are open to all show attendees in return for some sort of press or acknowledgement. It is the education of industry professionals old and new which sets a base for the entire industry to grow and progress, and whilst of course we are here to ‘turn a buck’, our ability to keep doing so is not dependant solely on our individual business prowess, but on the survival of the industry as a whole. This means fostering and encouraging new talent. We as individual firms have a role to play in ensuring that. AES has a role to play in ensuring that. And we all need to work together to do so. 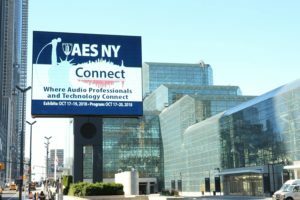 I personally believe that the AES show would benefit from revising its attendance pricing, and working harder to increase the dynamism and engagement of all of its program offerings, but perhaps I’m alone in this perspective. 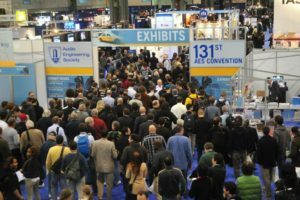 I’d be fascinated to know, what value do you find in tradeshow attendance, and what elements would you like to see changed?